The cold cathode type ionization gauge is used to replace the hot cathode type, as it produces errors at very high temperatures of the cathode. To overcome this problem, the electrodes must be roperly treated before use. All these problems can be nullified by vacuum measurement using cold cathode ionization gauge. A Philips and Penning cold cathode gauge is shown below. The device consists of two cathodes and a hollow anode in between. An input voltage greater than 2 Kilovolt is applied between them. A strong magnetic field is produced due to the applied voltage and thus the electrons are ejected. This causes the gauge to operate. At pressures below 10-2 Torr, the mean free path of the gas is so large that a collision may not occur at all so that discharge is not sustained or ionization may not be initiated. This problem can be eliminated by a collimating magnetic field. This is shown in the figure below. The collimating magnetic field increases the path length for the electrons, enabling discharges possible at pressures down to about 10-5 Torr. It is difficult to obtain linearity between the meter reading and pressure as there occurs interactions between the positive ions and electrons at high electric and magnetic fields. Ionization Gauge is a device that is used to measure vacuum. In the hot cathode type, a column of gas is introduced into which, a potential difference V is applied with free electron in the space. This causes the electron with a charge e to acquire a kinetic energy Ve. If the pressure range of the gas in the column goes below a certain limit, called the critical pressure, then corresponding to a voltage larger than the critical voltage Vc, the energy Ve may be high enough to initiate ionization, and positive ions will be produced when the electrons collide with the gas molecules. The value of Vc is smallest for cesium (3.88V) and largest for helium (24.58V), among monoatomic gases or vapours. For diatomic gases like N2, H2 and so on, it is roughly about 15V. This is known as the ionization potential and at this potential the pressure is also important. At very low pressures, during the intervals of time for transit from the cathode to the plate in a vacuum chamber, more than one collision is unlikely for an electron. Then for a fixed accelerating potential V>Vc, the number of positive ions formed would vary linearly with the value of pressure. Thus, a determination of the rate of production of positive ions for a given electron current should give a measure of the pressure. The construction of a hot cathode type ionization gauge consists of a basic vacuum triode. The figure of an external control type hot cathode gauge is shown below. The grid is maintained at a large positive potential with respect to the cathode and the plate. The plate is at a negative potential with respect to the cathode. This method is also known as the external control type ionization gauge as the positive ion collector is external to the electron collector grid with reference to the cathode. The positive ions available between the grid and the cathode will be drawn by the cathode, and those between the grid and the plate will be collected by the plate. The internal control type is shown below. Here the grid is the positive ion collector and the plate is the electron collector. One of the most popularly used hot filament gauges for industrial applications is the Bayard – Alpert type filament gauge. It consists of a helical grid with a potential of +150 volts. This huge potential attracts the electrons and thus causes gas ionization. At -30 volts, the gas ions are attracted to the central ion collector, thus producing an ion current of 100mA/Torr. This value is then fed to the electronic systems to be amplified and displayed. The hot cathode ionization gauge is useful in measuring the total pressure of all the gases present in the system. The biggest advantage of this device is its very small response time. This is because of the devices small inertia. The device is used for pressure measurement between the ranges of 10-8 to 10-3 Torr with an output current varying between 10-9 to 10-4 A. But this range depends on the gas, other things remaining constant. Where the pressure is higher than 10-3 Torr, the positive ions make a greater impact on the cathode to heat it up and ultimately destroy it. At pressure ranges below 10-8 Torr, in external control type, the electrons impact over the grid and radiates soft x-rays, which results in the production of electrons from the plates as secondary emission. These electrons produced will be of the same order as that of the positive ion current in the plate circuit and thus neutralizes this current. Thus the internal control type is known to be a better option to measure pressure as low as 10-9 Torr. When the cathode remains at very temperatures (say 3000 deg C), the gaseous matters present inside may reset with the filament or with themselves particularly at different pressure stages. This may causes the device to produce wrong outputs and may also affect the cathode life. During extreme conditions of high temperatures and low pressures, the presence of any gases inside the device, will be forcefully released, thus causing the pressure to increase. Thus, the electrodes have to be properly treated before use. This can be done only by passing high currents through the electrodes, especially the filament and the grid and by high frequency heating of the plate. To overcome these problems, the cold cathode type ionization gauge is also used by many. Alphatron is a type of cold cathode ionization gauge and can also be considered as a radioactive ionization gauge. As the cold cathode and hot cathode types earlier explained, are composition dependent, the transfer characteristics may be obtained relative to air for different gases and the system can be used as a leak detector. The device uses alpha particles in order to ionize the gas in the vacuum chamber. The number of ions formed in the chamber is directly proportional to the gas pressure, if the chamber dimensions are shorter than the range of alpha particles. The figure below shows the schematic diagram of an alphatron. The ions produced by the alpha particles are collected by the collector electrode and a current between 10-13 and 10-9 Amperes will flow though the resistor R. The output voltage e0 is measured using a high input impedance output meter. The device has a range between 103 to 10-3 Torr. A quartz reference gauge is a device used to measure vacuum. The working principle is pretty much same to that of a bourdon tube. Here, 2 bourdon tubes are used and a formed into a helix. When a pressure difference between the two occurs, the setup begins to rotate. This rotational deflection is picked up using an optical circuit as show in the figure below. The reason for using quartz is that it has good spring characteristics and if the unit is kept at a constant temperature environment, the angular deflection per unit pressure is repeatable. The main disadvantage with the device is that it cannot be used as a vacuum gauge in gases with fluorine content as this erodes quartz. The rotational deflection is connected into an electronic signal, after it passes through the optical circuit. This electronic circuit is further amplified and then the output is annulled using a servo-control system. The corresponding output is displayed by analogue techniques or counted digitally, which can be directly in pressure units. With a tachogenerator on the servomotor shaft a damping adjustment facility can be provided, if necessary. The device is known to have a resolution of 1 milliTorr for 100 milliTorr full scale reading. The working of a thermocouple type vacuum gauge is very similar to that of a pirani gauge. The only difference is that the hot wire temperature is measured directly with a thermocouple which is attached to a wire. For different pressures, the temperature is measured by the fine-wire thermocouple, the hating current being initially fixed by the resistance as shown in the figure. This device is usually used for comparison purposes. The sensitivity of such an instrument depends on the pressure and the wire current. The figure below shows the working of thermocouple gauges for comparison purposes. Two sets of thermocouples are used to measure temperatures of heater wires in the two chambers and oppose each other. When there is a difference in pressures, there occurs an unbalance which is measured by a potentiometer circuit. Instead of a single thermocouple per wire, a thermopile is often chosen to increase sensitivity. The thermocouple gauge is also composition dependent and needs empirical calibration for the high vacuum range. 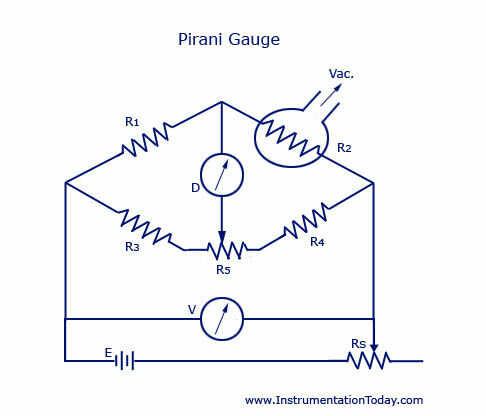 An additional reference gauge can also be used in the adjacent arm of another pirani gauge, in the bridge circuit. The additional gauge is evacuated and sealed, which helps in the compensaton for variation in ambient temperature. For commercial use, the range of the instrument can be extended from 10-3 Torr to 1 Torr. K – Flow conductance in the capillary. As p2 is very small when compared to p1, the flow rate remains practically constant and is proportional to the pressure. This forms the basis of the calibration. There are many variations of the McLeod Gauge. The basic construction is shown in the figure below. The gauge is used to compress a small quantity of low pressure gas to produce a readable large pressure. Bulb B of the gauge is attached to capillary aa’. The mercury level in the gauge is lowered up to l1 by lowering the reservoir, thereby allowing a little process fluid to enter B. By raising the reservoir, the gas is now compressed in the capillary aa’ till mercury rises to the zero mark in the side tube and capillary bb’. The capillary bb’ is required to avoid any error due to capillary. 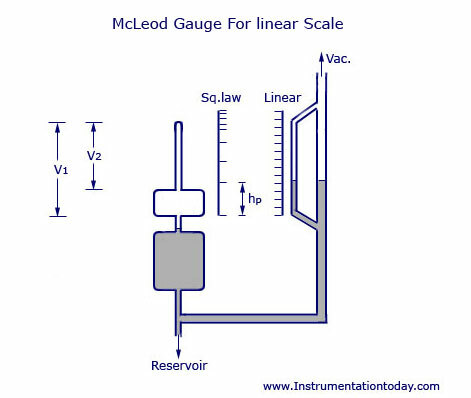 The McLeod gauge is independent of gas composition. If, however, the gas contains condensable material and during compression it condenses, the reading of the gauge is faulty. The gauge is not capable of continuous reading and the scale is of square law type. For linearizing the scale at comparatively higher pressures, a second volume is introduced as shown in the figure below, where the scale shown is linear. For pressure measurement below atmosphere or vacuum, different gauges are available. Manometers and bell gauges can go up to 0.1 Torr. Diaphragm gauges are usable up to a pressure of 10-3 Torr. For pressure below this value, electrical gauges like Pirani or Ionization Gauges are used. Vacuum measurement is broadly classified into Mechanical Type, Thermal Type, Ionization Type, and Radiation Vacuum Gauge. Resistance Strain Gauges can be used as a secondary element in pressure measurement. They can be joined together with bellows and diaphragms to effectively measure pressure. The figures below show the scheme of a differential pressure measurement. The figure below shows the arrangement of strain gauges that are mounted on a cantilever spring which is operated by a pair of opposing bellow elements. The cantilever is properly chosen in dimension for compensation in the change in the Young’s modulus due to temperature changes. The figure below shows an arrangement if strain gauges on to a flat diaphragm. Usually four gauges are mounted as shown and they are connected in a bridge circuit as shown in the figure. Radial and tangential stresses are developed in the diaphragm gauges complicating the measurement of true pressure. In recent years miniaturization is effected where the discrete gauges are replaced by a rosette which is available in various sizes. The rosettes may be configured such that the radial strains at the edge of the diaphragm and tangential strain near the centre are easily picked up while the solder points/tabs are located in a low strain region. Unbounded strain gauges can also be adopted for measuring strain and in consequence pressure with a diaphragm. A simple schematic of such a pressure measurement is shown in the figure below. Emperical calibration for all the above cases is always preferred.